The readers can download The Land: Founding: A LitRPG Saga: Chaos Seeds, Book 1 Audiobook for free via Audible Free Trial. 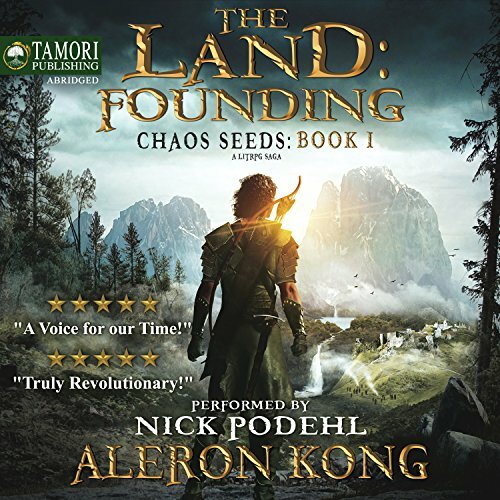 A many-times-heard story in the video game/comic domain, The Land: Founding: A LitRPG Saga: Chaos Seeds, Book 1 Audiobook by Aleron Kong depicts the story of an online gamer, James, that gets caught in an MMORPG game. The story begins with James and his friend beginning at this new online game called “The Land”. These friends, of course, dedicated hours and hours to level up and boost their skills until they become one of the top teams in the game. There’s where this white light comes in and James is suddenly sucked up into the game, without the possibility to go back to the earth. Once in the game, he learns that “Chaos seeds” are the core of human nature, which makes humans so destructive and able to generate chaos. James - whose gamer name is Richter - is actually very comfortable with being transported to a world plagued by monsters, goblins, and all kinds of aliens/magical creatures. He’s one of those characters that constantly make bad/inappropriate jokes about everything. The book itself behaves as a real MMO and the character needs to unlock skills and items in order to actually use them. This leads to a constant “item description” appearing every now and then when the Richter finds out anything. Taking into consideration that the book focuses on building a town/empire, the number of items is huge. Finally, after a few minutes, the audiobook gets more interesting as Richter starts to be challenged by nightmares and questions that are more or less defining his spirit. The Land: Founding: A LitRPG Saga: Chaos Seeds, Book 1 Audiobook by Aleron Kong is like the book by default of the LitRPG style. With a very common plot where the main character gets stuck in a game forever, the uniqueness of this novel lies in the focused goal. Unlike most of these stories, the main character’s (Richter) objective is to build a town, not overcoming dungeons. Further than that, the story actually advances pretty slow and the audiobook is plagued with item descriptions that would have enriched the story if they were used in moderation. Instead, the author interrupts the plot to add a description of virtually any item, whether it’s important or not. On the other hand, the main character, Richter, is definitely a “love him or hate him”. He’s filled with teenage inappropriate jokes and grotesque humor with tons of references to Rick and Morty. This kind of personality may be entertaining for some kind of specific audience as MMORPG gamers or geeks, but embracing the situation with this attitude from the beginning, makes him very unrealistic. If there was at least a short period of adaptation, with a bit of panic or bewilderment, maybe things would have felt more believable. Nevertheless, if the readers are into this online-gaming world and are used to this kind of writing and characters (and manage to overcome the item-description bombarding) the plot may become interesting. The narrative is good and may awake readers’ curiosity enough to wait for the next books. How exactly did Richter get summoned into The Land? The whole answer to this question is not actually answered in the book. But, the moment when he gets summoned is described as with a bright white light that comes from out of nowhere when he and his friends are about to get to the top of the game. What was Richter doing in his real life? As the narrative says right straight, James was a medical student. Nevertheless, this is never depicted in his personality or general knowledge.